Suitable for the grinding of material with quartz content up to 6 %, a hardness up to 6 at the Mohs scale and particle sizes from 10 – 360 micron. Suitable for nearly all kind of material; typical application is the big volume grinding of lime, dolomite, plaster, calcium, phosphate, minerals or similar raw material. The high pressure rollers, moved forward by the rotating grinding track, and the material crushing achieve the grinding process. 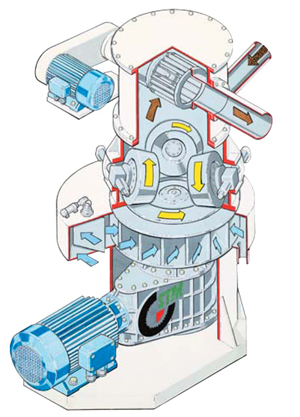 The crushing pressure is adjustable in order to modify the material fineness and/or according to different material specifications. 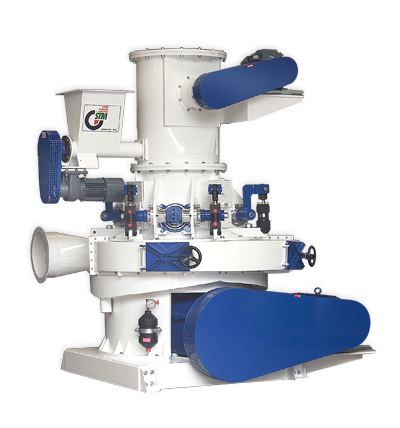 The integrated classifier rejects particles of unwanted size and returns them automatically to the grinding process until the requested size is achieved.